Jean-Luc Quentin-Hicks was born in Norwich in 1975. His father is from East London, a descendant of Italian and Russian Jews, his mother is French. Living in rural Norfolk with his wife and two young daughters Jean-Luc has only recently taken up painting on a serious level as a result of selling his flooring company where he worked for twenty five years in the building industry. Now having the time to pursue his interest in art he has discovered a hidden talent for producing stunning acrylic works on paper. Jean-Luc has had no formal art training and is developing his own style by experimenting with applying paint and having an acute eye for detail resulting in stunning views with the added interest of people going about their daily lives. 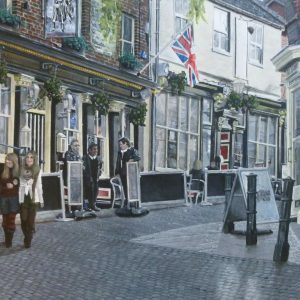 The paintings are mostly of Norwich showing both exterior and interior aspects, he has also recently completed a commission of London street scenes as well as painting some coastal views. 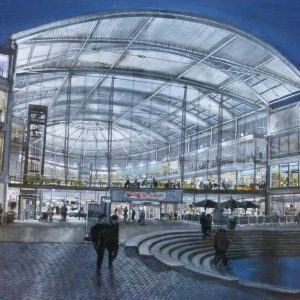 Norwich with its wealth of both historical and modern architecture combined with fascinating alleyways and paths provide an abundance of subject matter for Jean-Luc to explore and portray onto paper a record of buildings and everyday life. This painting is in the gallery unframed and can easily be viewed on request. A choice of suitable frames for “The Forum” painting are available. 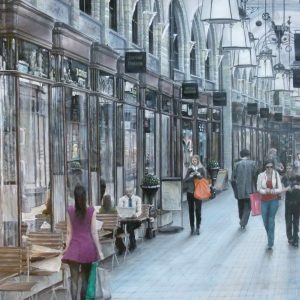 A choice of suitable frames for “The Royal Arcade” painting are available. A choice of suitable frames for the “Timber Hill” painting are available.